Hailed as the “Paganini of the Steelpan”, Liam Teague currently serves as the Head of Steelpan Studies and is an Assistant Professor of Music at Northern Illinois University (NIU). Along with Clifford Alexis, he Co-directs the Northern Illinois University Steelband. He has distinguished himself as the recipient of many awards in his homeland Trinidad and Tobago, including championships for his ability of the Steelpan, Violin and Recorder. In addition to being the Co-winner of the National Steelband Festival Solo Championship of Trinidad and Tobago, Teague won the Saint Louis Symphony Volunteers Association Young Artiste Competition in 1998. Under the baton of Dr. Paul Freeman, Teague with the Chicago Sinfonietta gave the world premiere of Illinois composer Jan Bach’s “Concerto for Steelpan and Orchestra” in 1995 at Orchestra Hall, Chicago. Many subsequent appearances with Chicago Sinfonietta have followed and among the most note-worthy was his 2001 performance at Kennedy Center. He has also performed with many ensembles including the Czech National Symphony, Panama National Symphony, Saint Louis Symphony, Dartmouth Wind Ensemble, University of Wisconsin-Madison Marching Band , TCL Group Skiffle Bunch and the BP Renegades Steelband. 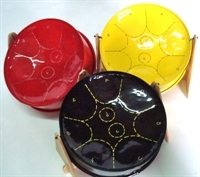 Teague’s commitment to demonstrating the great musical possibilities of the Steelpan has taken him to Europe, Asia, North and Central America, Australia, and the Caribbean. Some of these performances include opening for the MC Hammer tour of Trinidad and Tobago, stints at the St.Lucia , Grenada and Trinidad and Tobago Jazz Festivals and appearances at the Cool Drummings Percussion Festival in Toronto, Canada. As a performer and clinician, Liam Teague has given presentations at several Percussive Arts Society International Conventions and at many educational institutions throughout the world. He has collaborated with several prominent musicians including: Paquito D’Rivera, Zakir Hussain, Evelyn Glennie and Nexus. He holds Artist-in-Residence positions at Birch Creek Music Performance Center in Door County, Wisconsin and at California State University Summer Arts Camp, and has also presented recitals and clinics at Interlochen Academy for the Performing Arts. 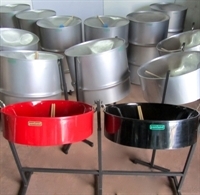 A strong advocate for original Steelpan compositions, Teague has commissioned a number of significant composers to write for the instrument including: Michael Colgrass, Jan Bach, Libby Larsen, Deborah Fisher Teason, Joey Sellers and Ben Wahlund. 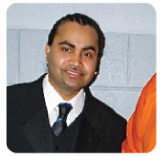 Many of his own compositions are published with MaumauMusic, PanPress and RamajayMusic, including: A Visit To Hell, Impressions, Raindrops, Chant and Dougla. Teague regularly appears in concert with NIU colleague and multi-instrumentalist Robert Chappell, as well as with the band they co-founded “Panoramic”. In 2002, “Panoramic” was invited to tour Taiwan as part of that country’s commemoration of its National Concert Hall’s 15th Anniversary. To date, Teague has recorded seven compact discs: “Hands Like Lightning”(1993),”Emotions of Steel”(1996),”Impressions”(1998),”T’nT”(2000) with Barbadian Saxophonist Arturo Tappin, “For Lack of Better Words”(2002) with Robert Chappell, “ A Christmas Gift” (2002) and “Panoramic: Rhythm Through and Unobstructed View”(2005). Teague can also be heard on the Merchant/Ivory production of “The Mystic Masseur” and also on the Albany Records release “Paul Freeman Presents: Exotic Concertos”. Teague received the distinction of being featured in the Chicago Tribune Magazine in a five page spread written by Howard Reich entitled “Man of Steel” on June 27, 1999. The article was subsequently republished in the Miami Herald later that year. From 2004-6, Teague served as musical arranger of the TCL Group Skiffle Bunch Steel Orchestra for the most prestigious Steelband competition in the world, Panorama, and for the 2005 edition of the World Steelband Music Festival held in Madison Square Garden, New York.